Really this could be one of those posts where I can just throw pictures out there and type "What not to do" in all-caps at the top. What's the fun in that, though? 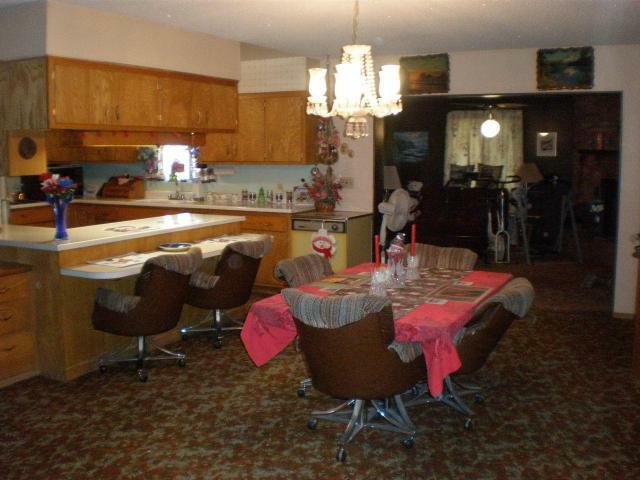 I can't scoff at sad home improvement decisions of times gone by- and boy, is this one a stunner. 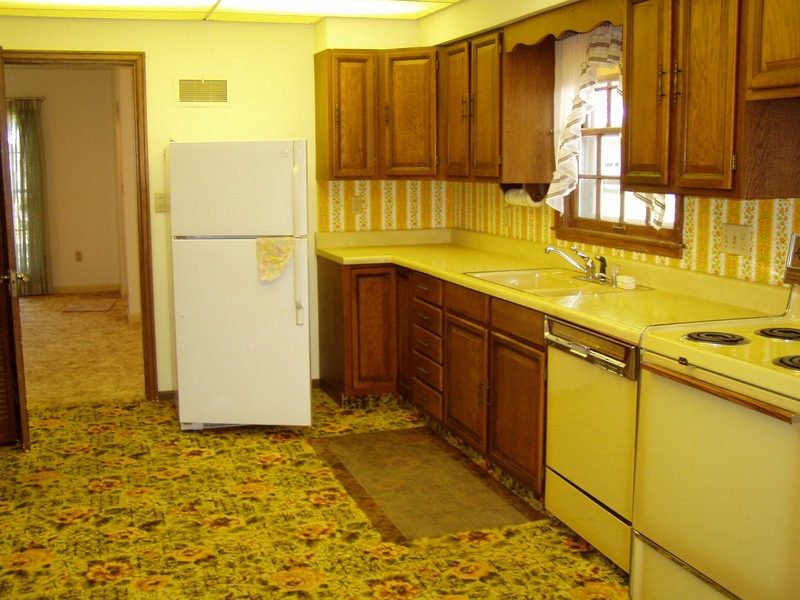 I've been blessed/cursed to have actually seen and worked on two spaces where there was carpet in the kitchen. 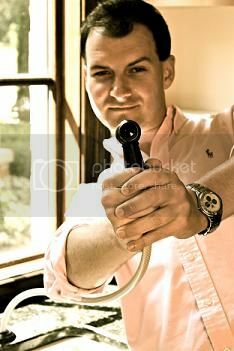 If your house has it, call an interior or kitchen designer(or the fire department) immediately. This one is lurvely... Nothing better than some teal/turquoise shag to go with Harvest Gold laminate counters. Here's the thing to remember: At some point, some one stood back and said, "This looks really good." Ahhh, NEW carpet in the kitchen. Everyone has that one friend that abuses alcohol- you know, the one that spills the entire box of wine on your floor? This photo was taken 10 minutes before they got there. I'm just not going there. "Dang it, Diane! 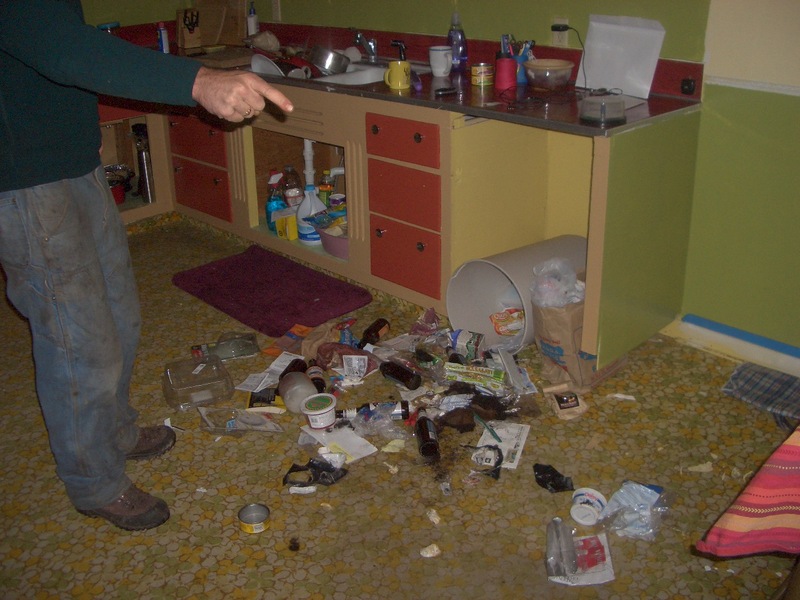 I took out our dishwasher so you'd have a place to put the empty chip dip bowls, beer bottles and junk mail and look how you repay me. Call the dog in here to lick the rest of this french onion dip up off the carpet." 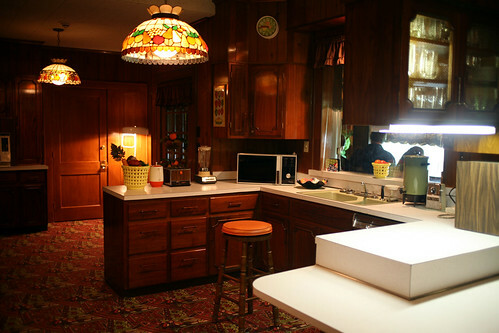 Even the King couldn't resist some carpet in the kitchen... Yup, this is straight from Graceland. Elvis loved the opulent. So class, what have we learned? Carpet in the kitchen will never be a good solution. 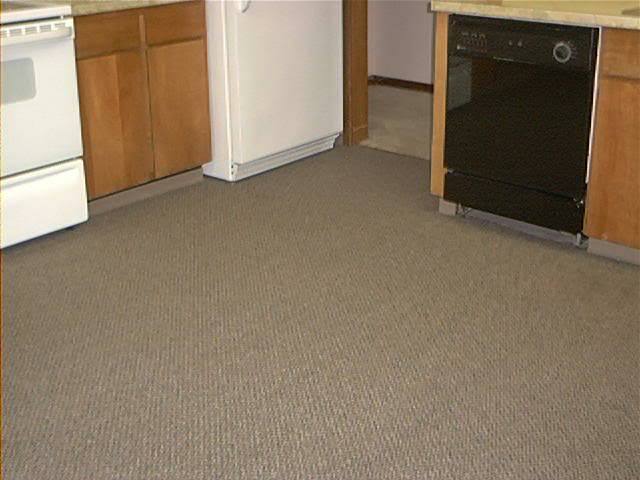 If you have an exceptionally hard flooring surface or your house was built on a concrete slab, there are some ways to make standing in your kitchen a bit easier on your feet. 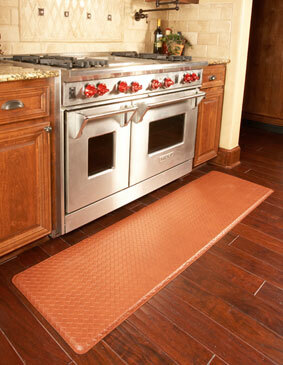 For many years, chef's mats were solely utilitarian and didn't really go with any one's decor. Nowadays these mats have taken a great turn toward being not just easy on the feet, but easy on the eyes. These are just two examples of GelPro mats that are available. It doesn't hurt that they are budget friendly, too! Sure beats having to scrub creamed corn out of a high-pile carpet. Now that I've typed this I can eat my breakfast(Had to save it just in case I didn't make it all the way through the post). So let's hear it people... Is there a good carpet for the kitchen? And don't worry... Carpet in the bathroom is coming. Nick, Where to start...I worked with a man at Lowe's way back when who had been in the cabinet department for years and years. He had "redone" his kitchen right before I started working with him and was very proud of it and wanted me to see it. 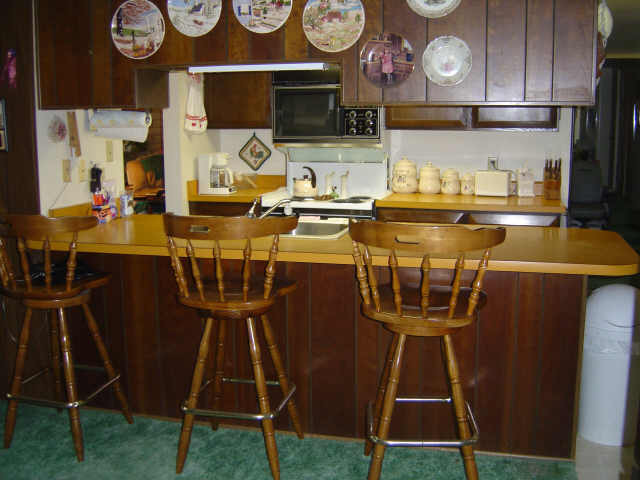 He had nice cabinets that I really could notll you anything about after going there because I could not get past the carpet in the kitchen!!! The pictures that you have included are truly hideous, including the one of Graceland. Now I am going to get back to work on trying to persuade some of my clients that less is more...wish ,e luck! Brenda- Less is always more, except when more is more. ;-) Thanks for the comment! When I saw the title, I was so scared that you were going to be promoting the idea of wall to wall carpet that I almost didn't click! I grew up in a kitchen where my mom had it. I have NO idea how she kept it clean. It was a tweed, greyish wool - but my gosh, I am far too sloppy in the kitchen to have carpet on the ground! Amy- I have a couple of small rugs in my kitchen. I launder them just like I do my kitchen towels... often. I've used the gel mats before and once you get used to it, it's hard to live without. Becky- The clear plastic mat adds to the appeal, eh? Let me put on my "devil's advocate" cap for a minute and ask you what if the carpeting in the kitchen was stainproof, waterproof, etc. Would you change your mind? If so why or why not?